Girls and guys basically have the same requirements for longboards. However, there are nuances and girls benefit from longboards with certain specifics. These are how well they can turn, how light they are, how safe they are etc. These things matter. Having the right board for you will help you get better faster and enjoy longboarding more. I have made a list of my favourite boards that are best longboards for a beginner girl. 7 plys, made from a mix of bamboo and hardwood maple with a slight camber & flexibility for added comfort. 7in Aluminum rkp trucks. Strong and long lasting. Turn really easily and give a nice responsive, maneuverable ride. Soft 70mm polyurethane wheels for a smooth ride. A brand that has featured on this website, quest are one of the go to brands for beginner boards. They produce reliable boards that are easy and fun to ride. The super cruiser is a topmount longboard making it have nice deep turns for maximum carving, cruising and that nice surfy feeling. Undeniably, this deck is beautiful. The exposed wood and natural grain of bamboo give the board a unique look. The board has a kick tail and up turned nose which are super useful for getting down curbs and picking the board up. The trucks are great for beginners and make great female longboards. It has Abec 7 bearings which are decent.. You get a lot of quality for a board this price. This board would be great for cruising, dancing, light freestyle and looking good! Regenerative braking to recover energy. Yuneec are a global brand that specialises in electronics. They make reliable camera and drone gear, and now they make skateboards. They have made one of the most affordable electric skateboards with the E-Go 2. You get a lightweight, compact electric skateboard that can go fast and far. You basically get a small rocket. The skateboard itself is reliable, you probably wont need to use its 2 year warranty. The board is a topmount so you get that surfy responsive ride. You can also get a lot out of it when simply pushing and cruising. The board can be controlled using the remote controller or your phone. The board comes in three stylish colours, you can get the one you like most. I really like this board, with how small and lightweight it is nothing beats its usefulness for getting around. Large wheels for riding over anything. Another brand we have featured before. Yocaher are back again with a great beginner board. The punked low rider has all the features for easy, stable riding. Its low to the ground (low c of g) and it has wide trucks. It gives a lot of room for error (great for beginners). Being low to the ground makes it super easy to push and footbreak with, I would use this to get to class or go to the store. It would also make a great women’s longboard for commuting. The board is drop down AND drop through. You can also mount it as a topmount for more maneuverability. Giving you a chance to experiment. The board has abec 7 bearings which aren’t too fast making them great for beginners. There are different colours so you can get the one that fits your style. Bearings are not that fast. As I beginner I didn’t know what to look for, with a bit of experience now I do. When deciding longboards for girls, you need to look at what riding style you will have and how comfortable the board will be, easy to ride, how easily it turns etc. We discuss these factors below. Do you want to dance, cruise or use it to get around? Stable boards are good for getting around, and you can also consider penny boards if you want something extremely compact. If you want to push, get a drop down board with wide trucks, you get stability and an easy time pushing. For dancing, top mounts are great. If you are planning on dancing, get a board that is 40in and longer so you have space to move around and do tricks like this badass girl. Watch how she utilises the space on her board and how it maneuvers. You want something like for dancing. If you want to cruise, almost any board will do (as this is the safest riding style) but you want something that turns and rides easy. Don’t simply pick a pink longboard, look into it and get the best board. Larger wheels will roll easier! You know how skateboard wheels can’t roll over pebbles? Large longboard wheels can overcome that. 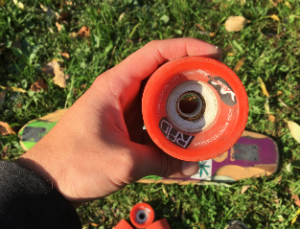 The larger the wheel diameter (70mm is perfect for cruising), the easier it rolls over surfaces and smoother the board rides. This determines how easily it rides. You also want to get soft wheels. These really grip well and absorb the roughness of the road. Its underestimated but they make skating a lot better. Wide trucks will be more stable! Wide trucks (10in) are more stable than narrow ones. but narrow ones are more maneuverable. If you want a nimble cruiser board, go with 7in trucks, and 10in for stability. This determines how easy a board turns. Smaller trucks have a tighter turning circle. Pick longboards that are lighter! Girls on average are lighter than guys so we need boards that are easier and lighter to turn. Also, it is a factor when you are carrying your board around. My first cruiser board was heavy and it was a nightmare carrying it all day. I made the next board smaller. You can guess the boards weight by the number of wood plys it has. This also determines how strong it will be. Composite boards are both light and strong. It should be easy enough to maintain any longboard. To avoid having to change out bearings, bushings etc. all the time. We should simply go for quality longboards. 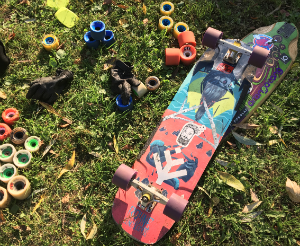 Getting a cheap longboard for a girl will do the job, but it may be uncomfortable to ride and the trucks get spoilt after a while. Its worth spending a bit more. Often you will have to replace bearings some faster ones. We also recommend you check out other girl skaters. (Longboard girls crew ) If you are starting out, join a facebook group of people who skate in your area. Its always nice to know people who do. Picking out your first board can be hard. Don’t sweat it though, just go for any options we’ve given you and follow our guide. You’ll be ok. If I had to start out again I would go for the Atom super cruiser, a board like that would be well placed on any beginners feet.